Weekly signals are based on weekly Open High Low Close stock price data and lead to a maximum of one buy and one sell signal and one trade per week. 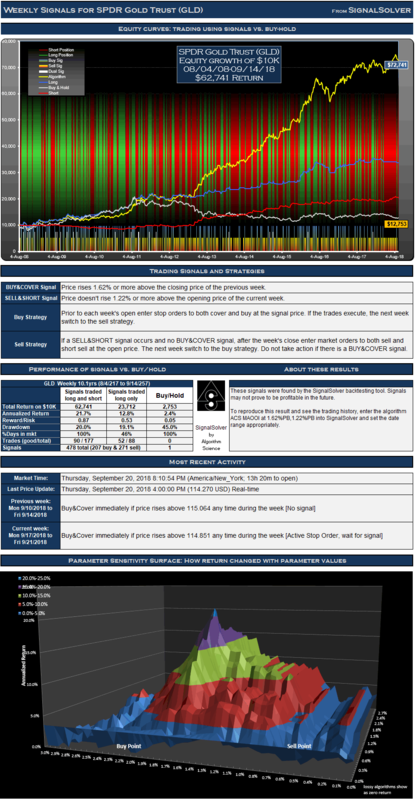 TQQQ signals (weekly) shown above were chosen for their reward/risk and parameter sensitivity characteristics. Backtests don't always generate reliable signals which can be counted on moving forward but many traders find value in knowing what buy and sell signals would have worked well in the past. 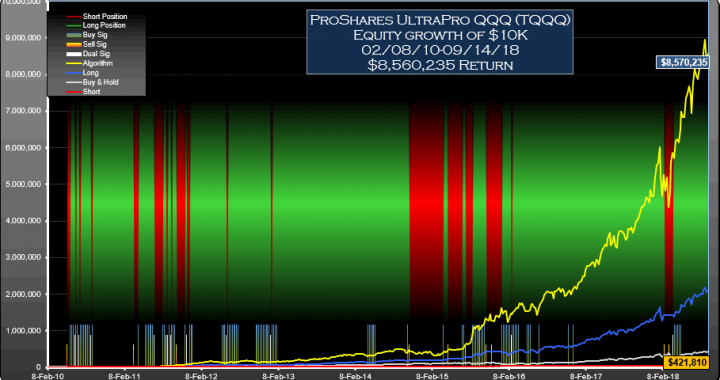 For the 449 week (8.6 year) period from Feb 8 2010 to Sep 14 2018, these signals for TQQQ traded both long and short would have yielded $8,560,235 in profits from a $10,000 initial investment, an annualized return of 119.5%. 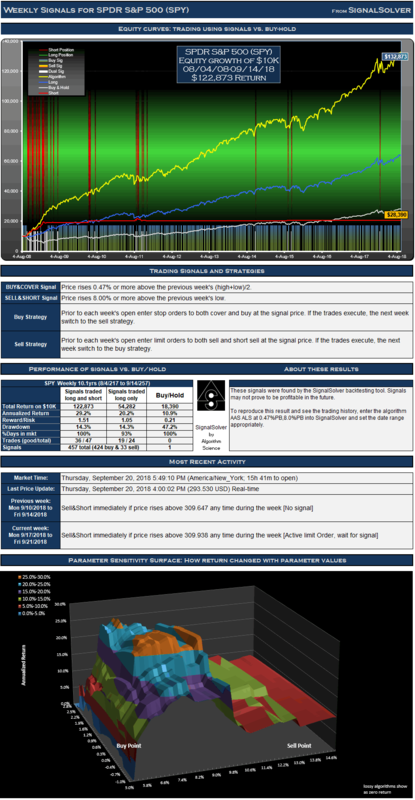 Traded long only (no short selling) the signals would have returned $2,085,458, an annualized return of 86.3%. 78.7% of time was spent holding stock long. The return would have been $411,810 (an annualized return of 54.6%) if you had bought and held the stock for the same period. Not all signals are acted upon and signals are often reinforced in this type of strategy. If you are long in the security, buy signals are not acted on, for example. Similarly if you are short you must ignore sell signals. There were 108 buy signals and 22 sell signals for this particular TQQQ strategy .These led to 18 round trip long trades of which 15 were profitable, and 18 short trades of which 14 were profitable. This is a weekly strategy; weekly OHLC data is used to derive all signals and there is at most one buy and sell signal and one trade per week. Drawdown (the worst case loss for an single entry and exit into the strategy) was 36% for long-short and 29% for long only. This compares to 44% for buy-hold. The reward/risk for the trading long and short was 2.89 compared to 1.11 for buy-hold, a factor of 2.6 improvement. If traded long only, the reward/risk was 2.54. We use drawdown plus 5% as our risk metric, and annualized return as the reward metric. 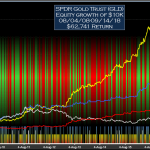 The trading signals for SPDR Gold Trust (GLD) were selected from over a million backtest results for their reward/risk and parameter sensitivity characteristics. Backtests don't always generate reliable signals which can be counted on moving forward but many traders find value in knowing what buy and sell signals would have worked well in the past. 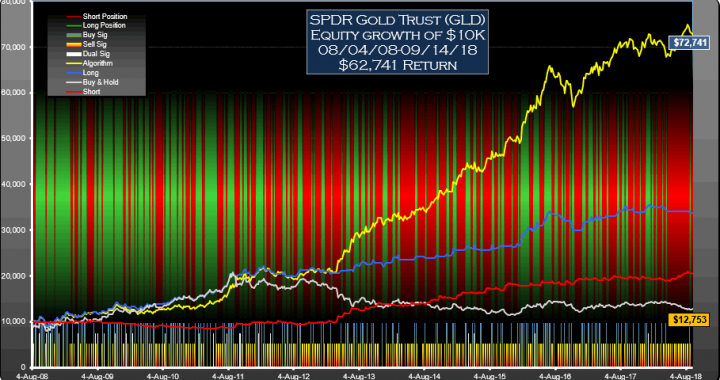 For the 528 week (10.1 year) period from Aug 4 2008 to Sep 14 2018, these signals for SPDR Gold Trust (GLD) traded both long and short would have yielded $62,741 in profits from a $10,000 initial investment, an annualized return of 21.7%. 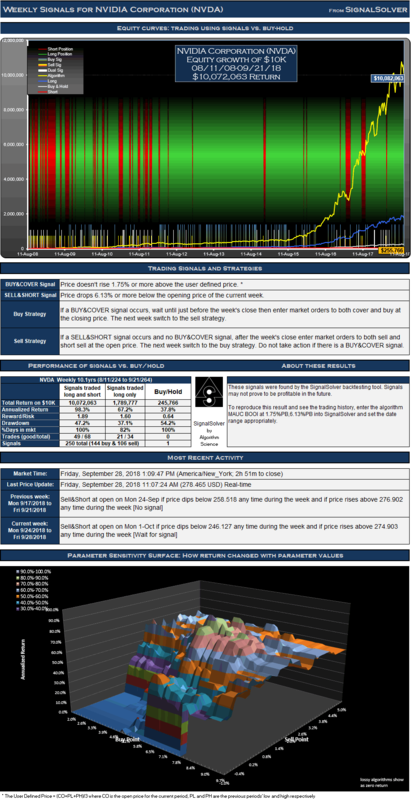 Traded long only (no short selling) the signals would have returned $23,712, an annualized return of 12.8%. 46.2% of time was spent holding stock long. The return would have been $2,753 (an annualized return of 02.4%) if you had bought and held the stock for the same period. Not all signals are acted upon and signals are often reinforced in this type of strategy. If you are long in the security, buy signals are not acted on, for example. Similarly if you are short you must ignore sell signals. There were 207 buy signals and 271 sell signals for this particular GLD strategy .These led to 88 round trip long trades of which 52 were profitable, and 89 short trades of which 38 were profitable. This is a weekly strategy; weekly OHLC data is used to derive all signals and there is at most one buy and sell signal and one trade per week. Drawdown (the worst case loss for an single entry and exit into the strategy) was 20% for long-short and 19% for long only. This compares to 45% for buy-hold. The reward/risk for the trading long and short was 0.87 compared to 0.05 for buy-hold, a factor of 17.8 improvement. If traded long only, the reward/risk was 0.53. We use drawdown plus 5% as our risk metric, and annualized return as the reward metric. The featured trading signals for SPDR S&P 500 (SPY) were selected from over a million backtest results for their reward/risk and parameter sensitivity characteristics. Backtests don't always generate reliable signals which can be counted on moving forward but many traders find value in knowing what buy and sell signals would have worked well in the past. 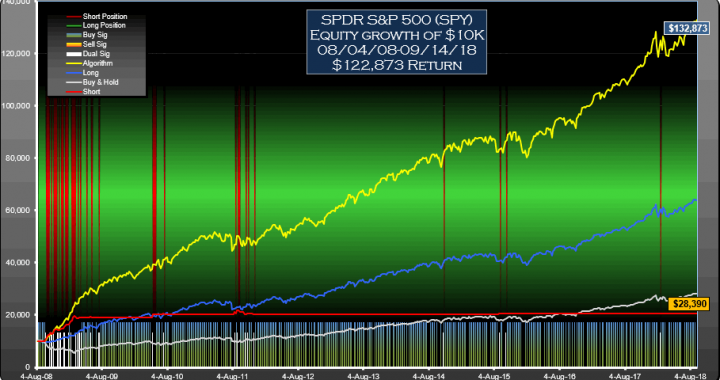 For the 528 week (10.1 year) period from Aug 4 2008 to Sep 14 2018, these signals for SPDR S&P 500 (SPY) traded both long and short would have yielded $122,873 in profits from a $10,000 initial investment, an annualized return of 29.2%. 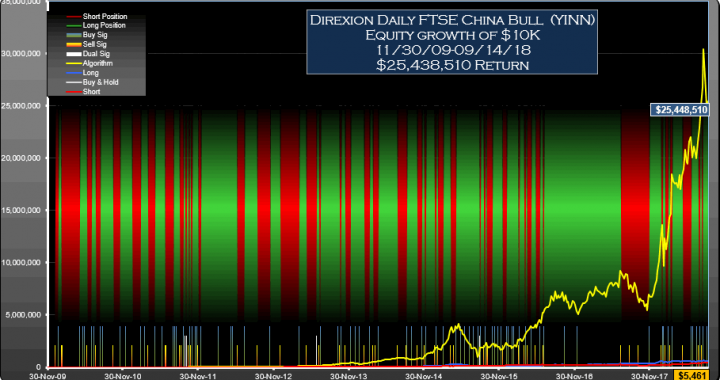 Traded long only (no short selling) the signals would have returned $54,282, an annualized return of 20.2%. 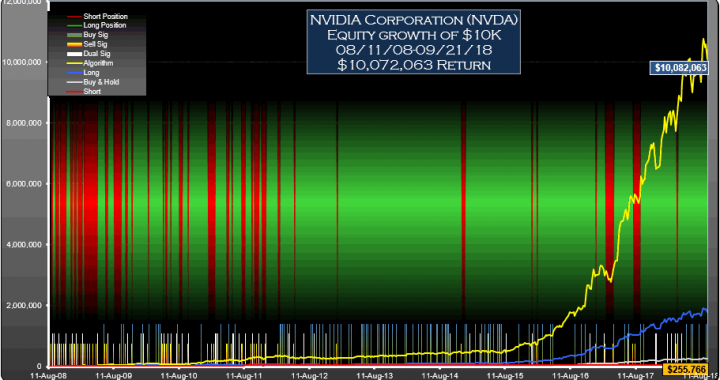 93.0% of time was spent holding stock long. The return would have been $18,390 (an annualized return of 10.9%) if you had bought and held the stock for the same period. Not all signals are acted upon and signals are often reinforced in this type of strategy. If you are long in the security, buy signals are not acted on, for example. Similarly if you are short you must ignore sell signals. 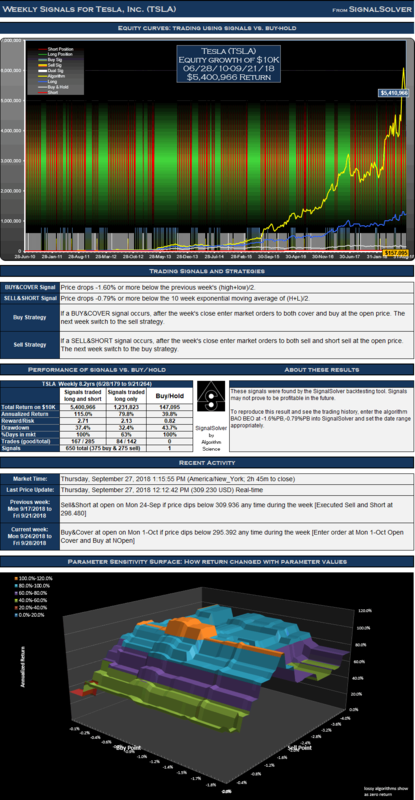 There were 424 buy signals and 33 sell signals for this particular SPY strategy .These led to 24 round trip long trades of which 19 were profitable, and 23 short trades of which 17 were profitable. This is a weekly strategy; weekly OHLC data is used to derive all signals and there is at most one buy and sell signal and one trade per week. Drawdown (the worst case loss for an single entry and exit into the strategy) was 14% for long-short and 14% for long only. This compares to 47% for buy-hold. 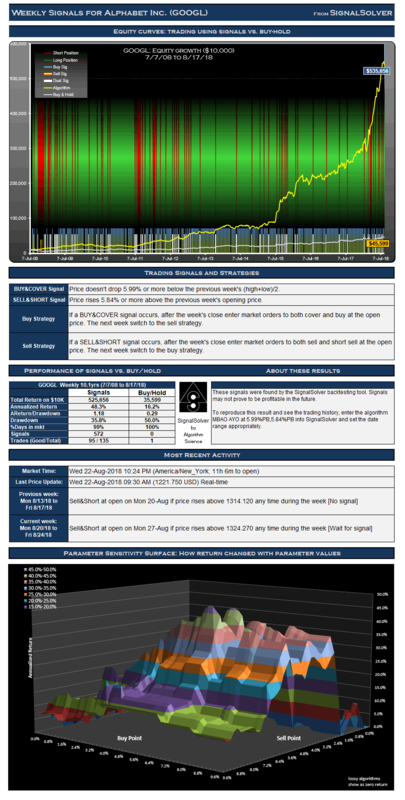 The reward/risk for the trading long and short was 1.51 compared to 0.21 for buy-hold, a factor of 7.3 improvement. If traded long only, the reward/risk was 1.05. We use drawdown plus 5% as our risk metric, and annualized return as the reward metric. 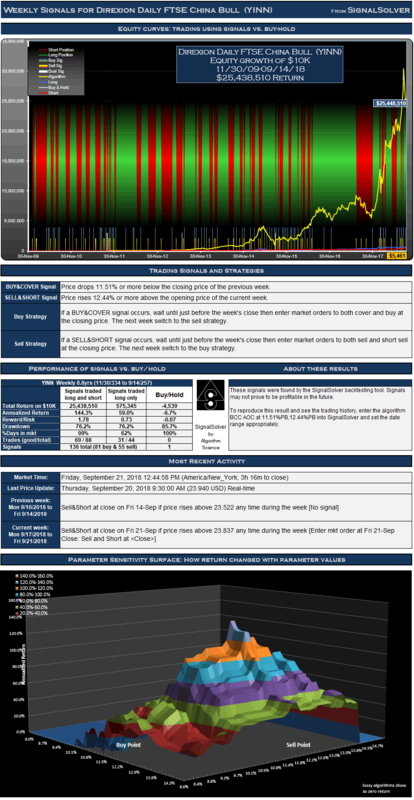 The trading signals for Micron (MU) shown here were selected from over a million backtest results for their reward/risk and parameter sensitivity characteristics. Backtests don't always generate reliable signals which can be counted on moving forward but many traders find value in knowing what buy and sell signals would have worked well in the past. 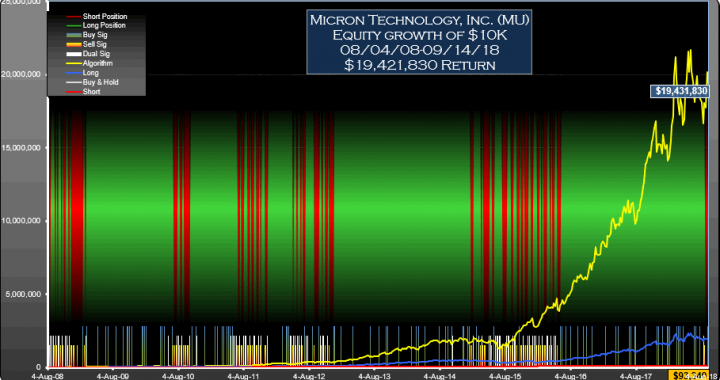 For the 528 week (10.1 year) period from Aug 4 2008 to Sep 14 2018, these signals for Micron (MU) traded both long and short would have yielded $19,421,830 in profits from a $10,000 initial investment, an annualized return of 111.6%. 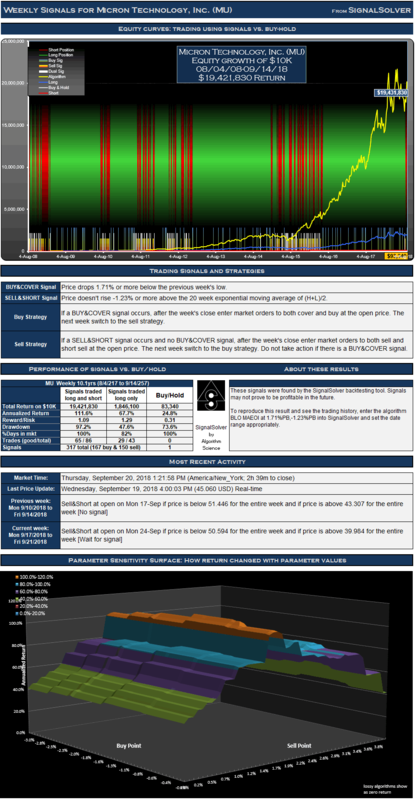 Traded long only (no short selling) the signals would have returned $1,846,100, an annualized return of 67.7%. 81.5% of time was spent holding stock long. The return would have been $83,340 (an annualized return of 24.8%) if you had bought and held the stock for the same period. Not all signals are acted upon and signals are often reinforced in this type of strategy. If you are long in the security, buy signals are not acted on, for example. Similarly if you are short you must ignore sell signals. 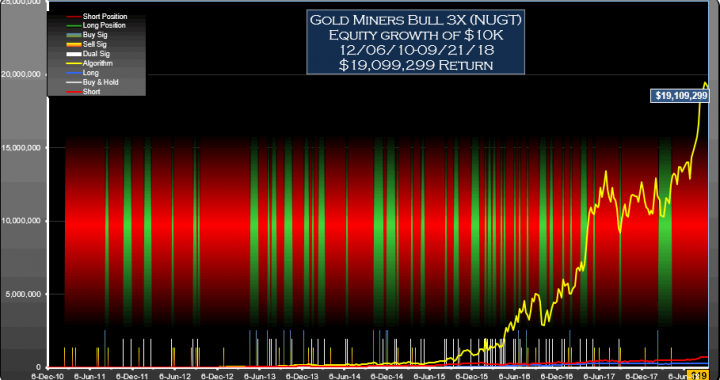 There were 167 buy signals and 150 sell signals for this particular MU strategy. These led to 43 round trip long trades of which 29 were profitable, and 43 short trades of which 36 were profitable. This is a weekly strategy; weekly OHLC data is used to derive all signals and there is at most one buy and sell signal and one trade per week. Drawdown (the worst case loss for an single entry and exit into the strategy) was 97% for long-short and 48% for long only. This compares to 74% for buy-hold. The reward/risk for the trading long and short was 1.09 compared to 0.31 for buy-hold, a factor of 3.5 improvement. If traded long only, the reward/risk was 1.29. We use drawdown plus 5% as our risk metric, and annualized return as the reward metric. 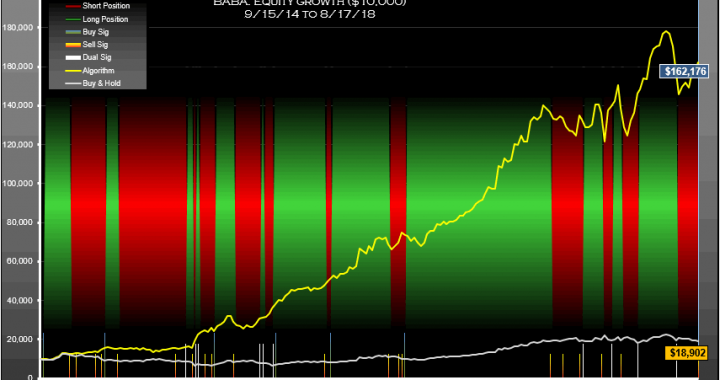 From Jul 2008 to Aug 2018, these trading signals for Alibaba (BABA) used as directed would have performed around 14 times better than buy-hold. 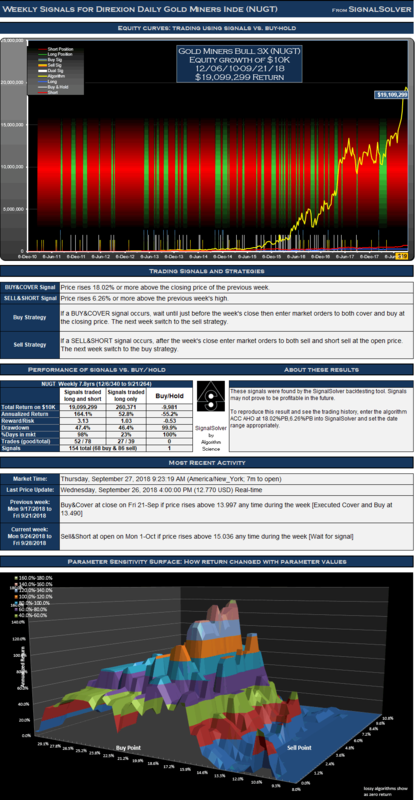 These trading signals for BABA were selected from 1,173,290 backtest results for their reward/risk and parameter sensitivity characteristics.While backtests don't always provide reliable signals which can be counted on moving forward, many swing traders find value in knowing what buy and sell signals could have been used in the past. For the 205 week (3.9 year) period from Sep 15 2014 to Aug 17 2018, these signals for Alibaba Group Holding Limited A (BABA) traded long and short would have yielded $152,176 in profits from a $10,000 initial investment, an annualized return of 103.9%. 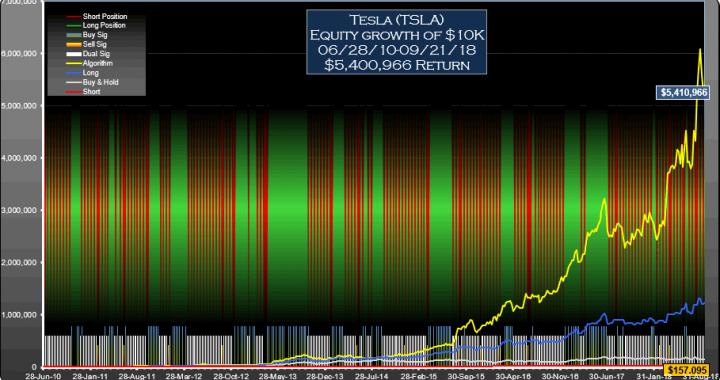 The long-side profit (buy/sell only, no shorts) for the signals was $50,880, an annualized return of 58.7%. If you had bought and held the stock for the same period the profit would have been $8,902 (an annualized return of 17.7%). The trading style was Long & Short, meaning that you would be long or short the security at all times. For this type of strategy, not every signal is acted upon and signals are often reinforced. If you are long in the security, buy signals can be ignored, for example. Similarly if you are short you can ignore sell signals. For this particular BABA strategy there were 16 buy signals and 30 sell signals.These led to 12 long trades of which 9 were profitable, and 12 short trades of which 11 were profitable. These Alphabet Inc. GOOGL signals were selected from 1,240,000 backtest results for their reward/risk and parameter sensitivity characteristics. While backtests don't typically provide reliable signals which can always be counted on moving forward, many swing traders find value in knowing what buy and sell signals would have worked over time. 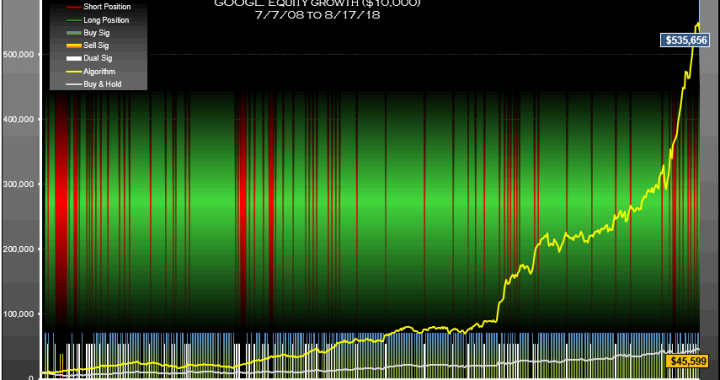 For the 528 week (10.1 year) period from Jul 7 2008 to Aug 17 2018, these signals for Alphabet Inc. (GOOGL) traded as directed would have yielded $525,656 in profits from a $10,000 initial investment, an annualized return of 48.3%. 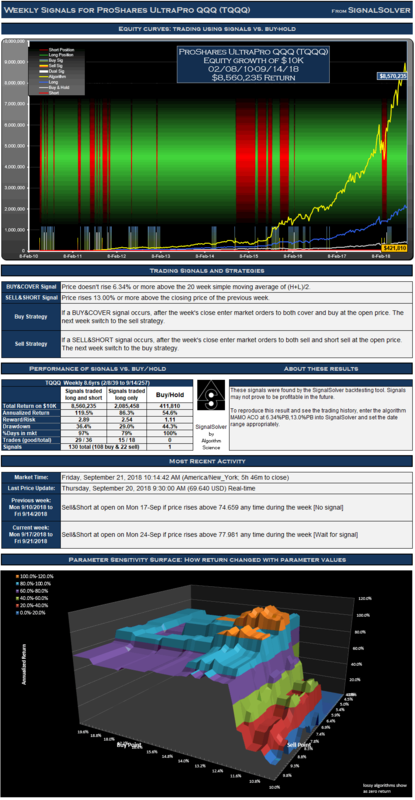 The long-side profit (buy/sell only, no shorts) for the signals was $175,257, an annualized return of 33.5%. If you had bought and held the stock for the same period the profit would have been $35,599 (an annualized return of 16.2%). The trading style was Long & Short, meaning that you would be long or short the security at all times. For this type of strategy, not every signal is acted upon and signals are often reinforced. If you are long in the security, buy signals can be ignored, for example. Similarly if you are short you can ignore sell signals. For this particular GOOGL strategy there were 471 buy signals and 101 sell signals.These led to 68 long trades of which 54 were profitable, and 67 short trades of which 41 were profitable.